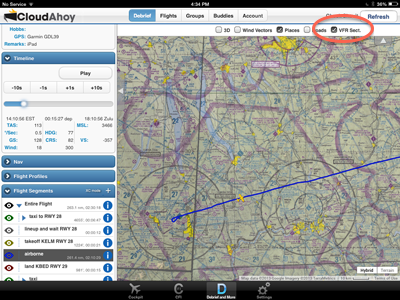 VFR sectional charts are now available in the iPad’s Debrief tab. Sectionals have always been available on the web’s CloudAhoy. This functionality is now working identically on the iPad. The sectionals are server-based, and therefore are slower to load compared to EFB tools. Recommended: iPad 3 and above. I was looking at the sectional in the debrief and have identified that the philadelphia sectional is out of date. Big new complicated change in the sectional you should take a look at it. Hi Michael. We, we are aware of that. We will remedy the situation. Thanks for a very useful app. Sectionals can be helpful. Also, may I ask, can we have speed/distance in statute miles as well as nautical? Hi Kayak Jack. Yes, it’s planned for a later version.